The AFR500v2 is here! We listened to our customer requests and provided just the additional features customers asked for. NTK Calibration grade sensor highly recommended for low AFR methanol applications. NTK Production Grade is the least expensive sensor we recommend for methanol applications. 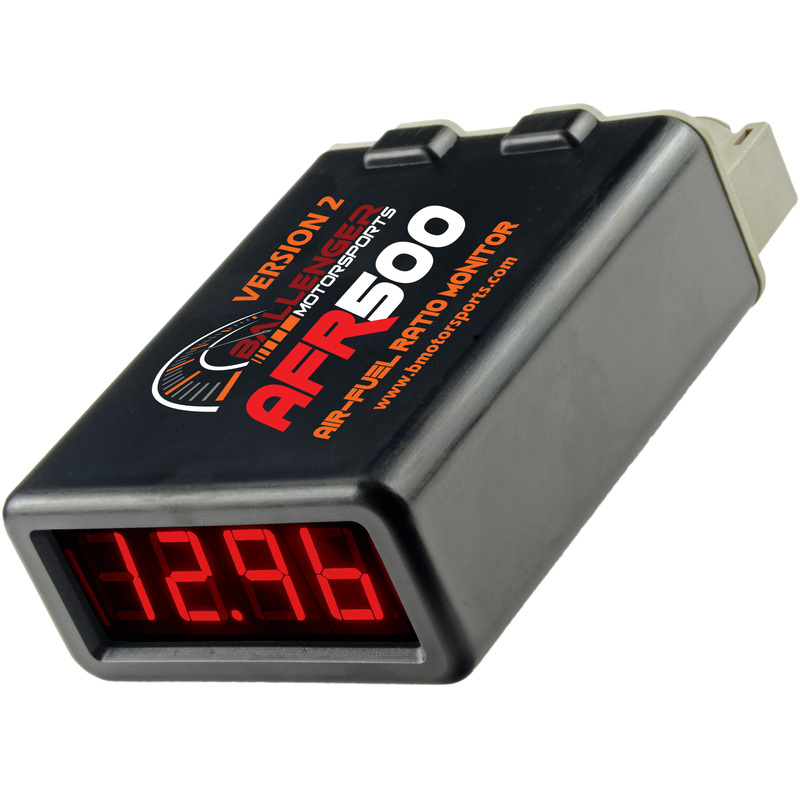 The AFR500 makes true wideband technology with top of the line measurement equipment available to enthusiasts and tuners for the first time. Air fuel ratio offers critical feedback for tuners to alter parameters to achieve maximum power and efficiency from their engine. The Ballenger Motorsports AFR500 Air Fuel Ratio Monitor offers a range of true wideband sensors from low cost options to lab grade sensors. No competing system offers this flexibility in this price range. Comparative systems typically sell for thousands of dollars for dedicated calibration equipment. The AFR500 is capable of reading air fuel ratio values from 9.0:1 to 16.0:1 (0.62-1.1λ) for standard range or 6.0:1 to 20.0:1 (0.411-1.373λ) for wide range with a resolution of 0.1 to provide excellent resolution in the tuning range of most performance vehicles. The Ballenger Motorsports AFR500 utilizes sensitive Nernst style, pump & reference cell based sensors that can detect a wide range of oxygen concentrations in order to properly interpret air fuel ratio in a variety of combustion environments. The Ballenger Motorsports AFR500 offers a linear analog output to be used as an input to engine control systems, gauges, or data acquisition systems. The output varies from 9:1 at 0v to 16:1 at 5v for the standard range or 6:1 at 0v to 20:1 at 5v for the wide range. Wholesale and volume seller inquiries welcome. If you have any questions, please feel free to contact us at sales@bmotorsports.com. Q. Why offer the NTK AFRM and the AFR500? A. The Powerdex AFX was discontinued to provide better margins with the NTK AFRM. While still the NTK AFRM is an excellent system, the AFR500 continues the calibration quality that the Powerdex AFX brought to the market. The NTK AFRM is a new architecture using a new sensor. We sell both and believe there is room in the market both for a budget NTK system and our calibration quality AFR500. Many of our customers want to use the well proven NTK and Bosch sensors with the known reliability and excellent track record that the prior system offered. To meet this need, we released the AFR500. The Powerdex AFX controller is identical to the AFR500 and therefore they share the same dimensions, specifications, features, & function. Q. Should I get an NTK AFRM or an AFR500? A. The AFR500 has a long, proven track record providing the accuracy, reliability & precision of systems typically costing $1500 or more. The AFR500 also works with several sensor options while the NTK AFRM only works with a single sensor type, only available from Ballenger Motorsports (SNSR-01006). The NTK AFRM was designed by a different group to meet a tighter budget. A simple explanation is that the NTK AFRM is an excellent consumer grade product while the AFR500 is an affordable professional grade product. Q. Can you explain these NTK sensor options? A. The NTK sensors come with varying levels of capability based on their intended usage. Most systems will simply offer an NTK sensor as a single option which can be misleading when you are comparing lab grade equipment at high cost to a system using the lowest cost sensor in the same family. We have chosen to provide customers with a full range of offerings. Q. Is the NTK sensor better than the Bosch sensor? A. In some cases, yes. For leaded fuel, for periodic moisture, or contaminant exposure the NTK sensor family clearly demonstrates superior performance. Many tuners have reported thousands of dyno hours on NTK sensors with leaded fuel while the Bosch sensors die quickly with lead. No sensor is immune from poor tuning however and a rich misfiring and exhaust backfiring engine can damage even the most expensive sensor in a matter of minutes. For a casual street user on pump gas, there is a less discernible advantage for the higher cost sensors. Q. Can you break down the sensor options further? Bosch LSU 4.2 Sensor: This is the sensor NGK packaged with the Powerdex AFX in 2010 and earlier. A solid sensor previously used in the majority of aftermarket widebands and many OEM vehicle applications. The Bosch LSU 4.2 is being phased out in favor of the LSU 4.9 in most applications. Bosch LSU 4.9 Sensor: An updated version of the Bosch 4.2 sensor redesigned for greater reliability in some applications. As other aftermarket systems have matured, they adopted this sensor later in their development cycle. This has given many the impression that this sensor is far better than the 4.2, while it simply showcases how poor many competing aftermarket systems were in their Bosch sensor control. As production is shifting to this sensor, the Bosch LSU 4.9 will become our standard Bosch sensor offering. Production Grade NTK Sensor: This is the sensor NGK packaged with the Powerdex AFX in 2010 and later. Newer and lower cost than the Calibration Grade NTK Sensor, this sensor offers the benefits of the NTK architecture at a reduced price. Calibration Grade NTK Sensor: This is a more robust and slightly more accurate NTK sensor typically used in higher end systems. The reputation of the NTK sensor was largely built upon this sensor. Lab Grade NTK Sensor: This is a highly accurate NTK sensor used previously only in systems costing $1500 or more. Q. Why is the AFR500 special? Why do pro tuners recommend it so heavily? Why is it better than other products? A. The AFR500 and the Powerdex AFX before it set a new benchmark in price / performance for the aftermarket. OEMs & Laboratories use extremely accurate and expensive hardware during calibration and detailed analysis for oxygen concentration values. Prior to the AFR500 & Powerdex AFX, this accuracy was only available at high cost and typically only known by pro tuners and professional calibrators. In the single instance of the AFR500, a major OEM supplier leveraged their relationship with the most respected laboratory & calibration equipment manufacturer to create an entirely new grade of product. While the AFR500 does not offer the bells and whistles of some systems, pro tuners quickly learned they were dealing with professional quality equipment that they previously paid thousands of dollars for at an incredible price point. With a wide range of sensor options available, the AFR500 allows tuners and consumers alike to use true calibration grade equipment at an incredible price point! Most aftermarket companies represent groups of entrepreneurs hoping to capitalize on a market niche that was not being adequately served. While other aftermarket products offer many ancillary features, their reverse engineering has only taken their fundamental function to a point of nearly as good. The AFR500 offers unrivaled accuracy, reliability and sensor longevity at this price point. Q. My sensor lasted ___ long, how do I get longer life from the sensor? Get a baseline tune before installing a sensor. You don’t need the sensor in most cases to get your baseline timing and fuel settings. NEVER leave a sensor in an exhaust unheated (disconnected). Don’t leave the sensor in continuously. Using only for tuning and specific monitoring periods will extend sensor life. Limit time in water cooled exhausts and avoid this where possible. Handle the sensor with extreme care. The sensing element is a delicate ceramic. Rough handling or drops may destroy the sensor. Never exceed 1700F (930C) EGT at the sensor. In high EGT environments, extended bungs such as SNSR-01064/SNSR- 01054 or Heat Sink Bung Extenders such as SNSR-01065 are strongly recommended. Do not install the sensor below horizontal. Ideally a sensor is between 10 and 2 and should be slightly off perfect vertical. Do not install the sensor near the exhaust port, in a pressurized segment (like a downpipe), or far after the collector. Do not leave the sensor on without the engine on for over 20 minutes. Except in the case of an extended calibration / cleaning cycle. During a calibration or cleaning cycle (an infrequent event), the sensor may be left on for several hours. Do not install the sensor while first setting timing and validating the engine. Backfire events & misfire events take their toll. Q. Is this a knockoff or replica of the NGK Powerdex AFX? A. No. The controller is identical and from the same manufacturer. The only changes at this stage are improvements Ballenger Motorsports has made to the wiring harness, labeling, & packaging. We also offer more sensor options & harness options. The changes to the harness are higher temperature & size optimized sleeving, sealed inline fusing, heavier gauge wiring, additional harness length options, and manufacturing at our USA facility to rigorous quality standards. Q. I have a Powerdex AFX and need to replace some parts, do you carry them? A. Yes. The parts between the AFR500 and Powerdex AFX are identical. We carry every component in the entire assembly such as the controller, sensors, harnesses, connectors, bungs, etc. We also now offer additional sensor and harness options that the Powerdex AFX is fully compatible with! Here are HP Tuners Calculations for the AFR500 as well as how to connect the AFR500 and configure the AFR500. *Bosch LSU 4.9 Sensor for AFR500v2 ONLY SNSR-01043 Bosch LSU 4.9 Wideband O2 Sensor ( UEGO ) for AFR500v2 ONLY!